Are you ready to downsize? Ready to sell, give away or trash all the material possessions you no longer need? Ready to see just how much you can get along without? If so, you might be ready for a tiny house. To some extent, I’ve bought into what she preaches. I’ve spent the past year purging my 1,600-square foot home of everything I don’t need or really, really want. (Which is only a problem in one area. Books. Because I love, love, love books.) In doing this, I’ve begun to wonder if maybe I don’t need 1,600 square feet. Perhaps I’m even ready for a tiny house. I’d seen them on TV but never in real life. So when I learned that the Tiny House Roadshow was coming to the Hyder-Burks Pavilion in early March, I couldn’t wait. What, exactly, is a tiny house? There’s no official definition, but a house that’s between 80 and 400-square feet is typically considered “tiny.” (Houses that are between 400 and 1,000-square feet are considered “small.”) Though tiny house are almost always moved—and sometimes parked long-term–on trailers, they differ from mobile homes or recreational vehicles in that they’re constructed using traditional building techniques and materials and are designed to last as long and be as aesthetically pleasing as traditional homes. Fewer than one percent of houses for sale in the United States fall into the tiny house category. I walked into Hyder-Burks that Friday afternoon ready to pick me one out. Some of the houses were just shells, waiting for a new owner to finish them out. Others were move-in ready. Those were the tiny houses that were drawing the big crowds. Some of them were amazingly luxurious. Granite countertops, stainless steel appliances, flat screen TVs. Others were more Spartan. As in no bathroom sink (“Take one step into the kitchen to wash your hands,” I was told), no stove and no room for the smallest of loveseats, let alone a sofa. But innovations were brilliant in all the tiny houses. An appliance that knew when to be a washing machine and when to be a dryer. King-size loft beds and smaller beds that slid out from under the kitchen floor and beds that popped up to make a table. Hidden closets. Fold-down computer stations. More nifty stuff than this little column gives me room to mention. To which she replied, “Who’s that?” For once, I was speechless. The tour over, I headed home to my unbelievably spacious 1,600-square foot house. Where, for the time being anyway, it seems best that I stay. I’m not ready to part with my books. 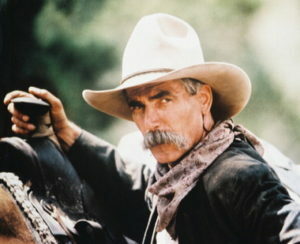 And you never know when Sam Elliot might come knocking.